Table Name: the name for each table. Engine: the engine used for each table(by default MyISAM). Collation: the collation for each table(usually utf8_general_ci). Number of Rows: the number of rows occupied in each table. Data(kb): the size of the Data stored in each table. Index(kb): the indexes of the respective table. Overhead(kb): the Overhead of each table. Result: the Result of the check. 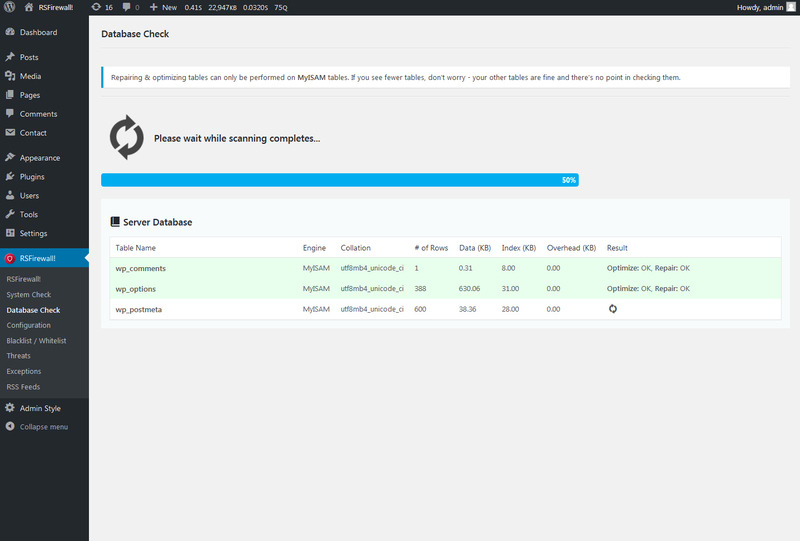 The Database Check checks, analyses and optimizes your WordPress tables. If any table is found corrupted it will attempt to repair the respective table without losing the data from it. On some tables, on which many operations are done, an optimization will be made, although in some cases this will not be needed. Table optimization verifies for the following: if the table has deleted or split rows or if the index pages are not sorted. Depending on the cases the check will: repair the table or sort indexes. Note: the Database Check only works with MySQL databases.